We have a number of promotional laundry bags that can be customized to promote your brand. The customized Wash Me laundry bag is made of 100% cotton. The logo laundry bags have a front pocket with a drawstring closure. The custom laundry bags can be air dried quickly. You can screen print the promotional laundry bags without paying any set-up fees. The available colors are natural, royal blue, red, or black. The imprint area of the customized laundry bags is 4-1/4" W x 6" H. You can choose a multi-colored imprint. We provide variations up to 4 colors. We have a free 24 hour rush service on the promotional laundry bags. The branded Mesh Laundry Bag is made of 210D Nylon. 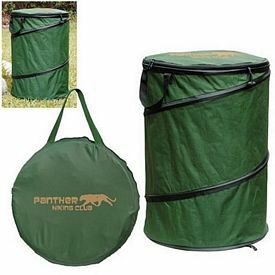 The soft nylon mesh body helps in circulating the air inside the custom laundry bag. 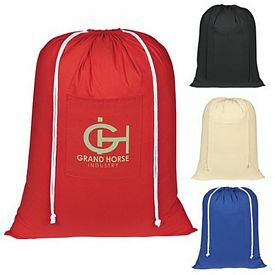 The promotional laundry bags come with drawstring closure. The customized laundry bags are available in various colors. 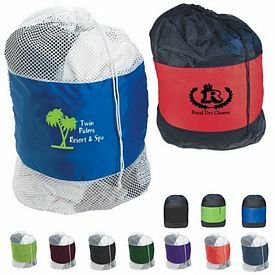 You can buy laundry bags in white mesh with black, red, navy, purple, forest green, burgundy, lime green, or royal blue. You can also order black mesh laundry bags with black, red, royal blue or lime green accents. We will customize the promotional laundry bags with one color logo imprint and you can upgrade it to multicolour imprint in three colors for an extra charge. The size of the custom laundry bag is 25" W x 36" H. There is a free 24 hour rush service on the logo laundry bags. No set up fees will be charged and free artwork eproof will be done for all the promotional mesh laundry bags. Customized scented non-woven laundry bags can work as exceptional advertising products for your company. The customized laundry bags are made of non-woven polypropylene material. 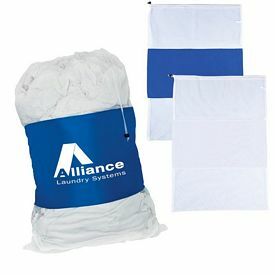 The promotional laundry bags have huge carrying capacity and are attached with a drawstring closure. The logoed laundry bags are ideal promotional products for students. We will do a silk screened one color imprint on one side of the custom laundry bag. You can upgrade the polypropylene laundry bags to full color digital printing. We provide the promotional laundry bags in light blue color and a paid two day rush service. The branded scented non-woven laundry bag full color digital is one of our popular promotional products. The non-woven polypropylene material is not only water-resistant but also prevents tears. The large capacity and light blue color makes it the perfect choice amongst students. 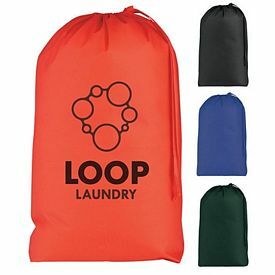 The logo laundry bags have a drawstring closure. We use four process colors including cyan, magenta, yellow, and black to create your fully colored company logo with your chosen font. The full color digital printing and artwork eproof are included in the price. We will not charge any set up fees. There is a guarantee of exact PMS matches and color. We do not have neon and metallic colors. You will get an imprint area of 5-1/2" W x 10" H on the customized laundry bags.